You can now have your customized jewelry engraved with any art or letters of your choice. This wonderful pendant is made up of 14K yellow gold and the yellow gold makes the pendant enriched and glowing. The dimension of this wonderful pendant is 20mm x 10mm. The shape of this pendant resembles a girl's head. The unique design and features makes it a prized possession and owner's pride. Design your look today with this marvelous piece of art and attain the coveted style icon looks. 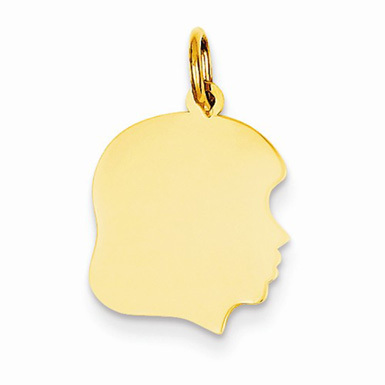 We guarantee our Engravable Girl Head Charm in 14K Yellow Gold to be high quality, authentic jewelry, as described above.